SprayWorks Equipment Group will be exhibiting at the 2012 Insulation Contractors Association of America (ICAA) Booth #94 in Dallas,TX at the Hyatt Regency. On display from SprayWorks will be PMCs PH-series spray foam machines, Transfer Pumps, heated Hoses, Barrel Blazer Drum Heaters, SprayBot, Mobile spray foam rigs, and the New AP-2 Spray Gun. Receive show discounts on all spray foam equipment Oct 4th through the 6th. PMC is known for manufacturing high end quality spray foam and coating machines “made in the USA” located in Lakewood NJ. PMC offers a special promotion to the industry throughout the month of April. Purchase a classic GH-40 machine and receive an auxiliary equipment package for “FREE” giving you an incredible value! “Designed with the customer in mind” The GH-40 hydraulic proportioner is offered in two models with outputs of 40 lbs/min at pressures up to 2000 psi and outputs of 2.5 gpm at pressures up to 3500 psi and include Relay logic Controls, Passive High Capacity Hydraulic System, Easy Hose Heat Tap settings adjust up to 410ft, Open Frame design combined with a serviceable temperature sensor unit (TSU). 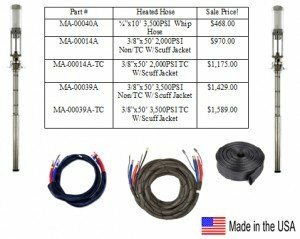 Featured in PMC’s April Special Promotional auxiliary Free equipment package consist of a section of 50ft heated hose with scuff jacket, a uniquely system design that features a copper weave heating element to provide full hose coverage along with a 10ft heated whip hose. Also included is and AP-1 Spray Foam and Polyurea Gun. The AP-1 Spray Gun is designed with a 360° rotational spray head, quick change mixing chambers, easy access to internal parts along with an innovative air cap design to prevent chemical build up in the tip. This fabulous offer includes a complete package of spray polyurethane foam accessories to benefit the seasoned professional or for customers just starting out in the spray polyurethane foam and coatings industry. SprayWorks Equipment is dedicated to brining the spray foam and coatings industry quality products at a price you can afford PMC’s unique universal design heated hose system design features a copper weave element to provide full hose coverage for more efficient heating. All heated hose assemblies comes with a standard 1 year manufactures warranty. Get a PMC 2:1 transfer pump and 3,500Psi 10ft heated whip hose for only $1,250. Click here for our guide on How to Choose the Right Hose for your Machine. In appreciation for a successful turnout at this years annual SPFA convention and expo (PMC) Polyurethane Machinery Corporation is offering for a limited time and additional 10% discount towards the purchase of any AP-1 Spray Gun and (TSU) Temperature Sensing Unit. Complete the information below and submit it to SprayWorks Equipment Group. The AP-1 Spray foam gun and TSU easily adapts to your existing Spray Foam Machine. Don’t miss out on the savings! Offer expires 3/15/2012. For more information contact us today. SprayWorks Equipment Group unveiled its new heated drum rack transportation system at the SPFA Expo in Dallas. The stationary heated drum rack design allows for contractors to easily install the system in their mobile spray foam rigs and box trucks. The new heated drum transportation system features Hi and Low temperature setting as well as an optional insulated jacket. The optional insulated jacket is best used in extreme cold environments, long distant hauling and for those products that require 90+ degrees. The Drum Heaters allows contractors to maintain heat in the barrels overnight as well as having the option for a boost of heat on those cold days including products that require higher drum temperatures. The new spray foam and coating machines from PMC. The new PMC PA series was developed to provide the applicator with and economically priced machine that is user friendly, serviceable and designed to meet the modern day spray foam and fluid applied coatings requirements. The PMC PA series spray foam and coating machines will be available in two models. The PA-25-2000 and the PAX-25-3000. The PA-25-2000 series spray foam machine is and air driven proportioner with and output of 25lbs/min and capable of up to 2,000PSI. The PA-25-3000 series coating machine is and air driven proportioner with and output of 1.3 gal/min and capable of up to 3,000PSI. The machine’s features a 7″ air motor , 7,500 watt heaters with the option of larger heaters. Weighing only 265lbs the PA series open frame design allows easy access to all of the major components. The PA and PAX machine’s also features state of the art reversing valve reversing the pump direction with out the need for electricity! Polyurethane Machinery Corporation (PMC) is celebrating 5 Years of Excellence supported by over 100 Years of Proven Experience! uniquely designed PMC Temperature Sensing Unit to two lucky winners! Visit Booth #607 for Your Chance to Win! Come see the Next Generation “Classic” PH Series hydraulically operated proportioner being introduced exclusively at the show. This series of machines will offer the consumer a more rugged design to withstand the rigors of a contractor operation. The new “Classic” PH Series is offered in four models ranging from outputs 25-40 lbs/min and pressures from 2000-3500 psi. The PH-40 Proportioner from PMC is designed and built for the spray polyurethane foam and polyurea industry. Not to mention some specific two-component epoxy systems. The machine is designed with two independent Primary Heaters with no internal seals. Used for presetting manufacturers temperature product recommendations Each Heater has Six Heating Elements known in the industry as (fire rods) rated at 1,250 watts each with (1,500 watts optional) giving the PH-40 machine a total heat of 15,000 watts or (18,000 watts optional) and the necessary control and safety components for their precise operation. The Primary Heater design allows a temperature differential (ΔT) of 90º F and material application temperatures of up to 190º F under normal ambient temperatures. SprayWorks Equipment Group to exhibit at the spray foam convention & expo January 30th 2012 – February 2nd 2012 located at the Intercontinental Hotel Crystal Ball Room booth #707 Dallas, Texas. We will be featuring some the most advance technology and items made in the USA for the spray foam and coatings industry. SprayWorks will also be show casing and demonstrating the Robotic Spraybot. Learn how to make high end production, save money and apply spray foam and coating applications to meet the industry’s most demanding specifications. Inspecting the iso pump lubricant reservoir on your spray foam or Polyurea machine is often overlooked and should be part of a daily routine. Pump Lube forms a barrier between the ISO and the atmosphere. The lubricant will require changes pending the environment it is operating within. Typically every 3 to 4 weeks a gel formation occurs. This is due to moisture absorption by the pump lubricant. Another entity that occurs is that different types spray foam and coating machines pumps have some form of seepage when using isocyanate during operations by-passing the pump packing’s. This in return can eventually cause a thin film build up on the pump shaft creating damage to the packing’s. Early signs that the iso pump lubrication will need changing is its color darkens or contamination with the iso component turning into a milky white in color opposed to clear in liquid color. When checking the fluid another area of concern to pay attention to is the check valve attached in line of the pump lube suction hose. This can become clogged with geld material and can result in a plug the system preventing recirculation of the fluid. Taking a preventive maintenance step in conjunction with utilizing the re-tract / park feature on your spray foam machine will help extend the life of your pump and pump packing’s’.